The Talozzi family run a restaurant here in Anghiari. Although relatively recent arrivals (having moved here from Siena in the 1960s), they are passionate about this place. They are also passionate about offering a welcome to all, a welcome to ‘i stranieri’ (foreigners, strangers). The restaurant is now run by Cinzia, who does the cooking, and her two daughters, who help in the kitchen and in the restaurant. Cinzia was nine when the family moved here, for reasons related to her father’s work. He became the mayor of Anghiari for 16 years, and made a big contribution to the development of the town as a cultural centre. The family continue this tradition. Cinzia’s daughters, for example, are very involved in organising musical events, the most important of which is the Anghiari festival in July when, for a week, the south bank sinfonia perform concerts here and in nearby towns. Cinzia’s father now has a restaurant (in warm months) in the hamlet where he lives. Needless to say, he cooks with vegetables from his kitchen garden. During lunch, Cinzia came in and out of the kitchen, and we talked about food and recipes for her dishes, and politics – il mondo di Trump, for example. It was in the context of this political discussion that the theme of welcome to strangers first came up. It was to be central to the interview. Both Cinzia, and her daughter Armida, whom I also interviewed, value hospitality above all else. 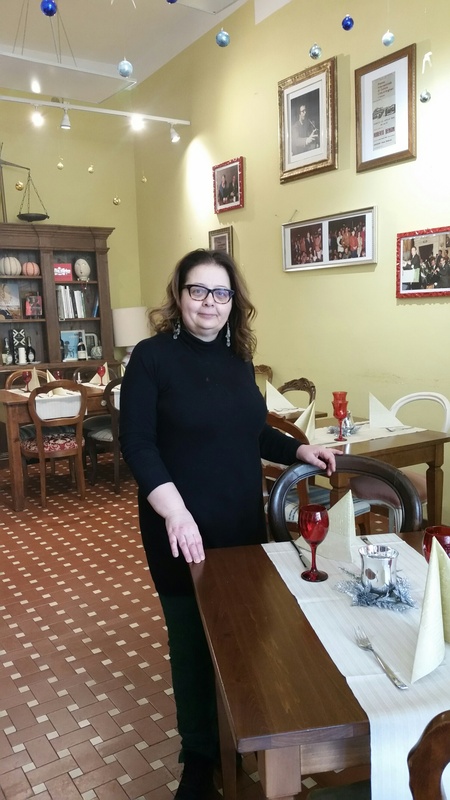 Cinzia spoke about this in terms of both the hospitality she hopes to offer in her restaurant, and immigrants and asylum seekers. Italy has a long history of immigration, both in and out of the country, she said: we are all immigrants, all ‘mixed’. Cinzia and Armida say that they wish to welcome people into the restaurant as they would into their home, into their ‘living room’. And, like other restaurants here, that is how it is furnished. It has the feel of being in someone’s home. They both make you feel completely at home. Armida told me that people often eat here by themselves (always the sign of a good restaurant, I think), and described how she invites solo diners to join each other. As you can imagine, this takes considerable judgement, in a very short space of time! It makes her happy when guests return to the restaurant together. Both mother and daughter are unequivocal in their welcome to tourists and their gratitude for what visitors offer the people of Anghiari: they open us to different worlds. They also think it important to travel; both have lived in other places and Armida now travels every year. Cinzia said ‘We have roots here in Anghiari, but travel opens our minds. Being with Cinzia and Armida, I had a real sense of ‘ospite’, the Italian word that, meaning both host and guest, perfectly expresses the relation at the heart of hospitality, the relation that makes it impossible to distinguish who gives and who receives. In their openness, there was just a wonderful sense of joy and life about these people (however bleak the political landscape might be). Oh, and another thought: ‘grazie’ – ‘prego’ has the same logic of grace as ‘ospite’: thankyou – please, I pray. I was reflecting further on your post about visiting the fruit store and the butcher. I had written, a few months ago, about greetings in a similar context (my local green grocers). And I was thinking about what makes it so easy to fall into such, almost impersonal, but genuine forms of sociality. I think, in the case of my green grocers, it is not just the produce, but also the layout of the store. Like most green grocers they have an open area where fresh produce is laid out on low, slanted shelves that allow you to walk along an isle, but see across to the other isles. Unlike a supermarket or grocery store where you are wedged in along narrow isles (and where you feel you need to hustle for space), the section at the front of the store feels gloriously open. I can see the rows of fruit and I can see what other’s are looking at. I often bump into neighbours here too and it feels okay to stand around in these open isles chatting – you don’t feel like you are getting in anyone’s way. The layout is different from Galuzzo’s in Glebe, which, as you know, is tight and bustling. But even there, there is a sense of opening onto the street. And they place some of their choicest produce out on the street where you can see it. I suppose it is significant also that the registers at Galuzzo are right there, at the entrance, almost on the street. All of the daughters and sons and other family members who man those registers always seem to be calm and almost joyful in the face of the hustle around them. That does something, I think, to the whole feel of the shop. I wonder if they are hosts, in the way you have been writing about it. Thank you for these beautiful posts. It is a lovely opportunity to meditate on the logic of the everyday here too. Thank you Demelza. I am so glad to hear that they ring true for you. I find that the discipline of doing them helps me pay attention! Btw, the boxes of fresh vegetables here are outside the shops and on the floor inside. But the spaces are nothing like those of similar places in Australia: they are tiny! It’s amazing just how much they store in small spaces. And people are quite happy standing close to each other in these spaces, moving with ease around each other. There is no sense of being pushed.